Navigation: User Guide -> Windows -> Editing Project Window This page is for SysCAD 9.3 Build 137 or later. For earlier builds, including SysCAD 9.3 Build 136 and SysCAD 9.2, please see Project Window 9.3. The project structure is outlined in the Project Window. Files This is used to list all associated files for the current project. Conversions This is used to list all the engineering units available to the user. RefTags This is used to list all the variables referenced by the PID controllers or Pgm files. Caution: If you click on the X button on the top right hand corner of the dialog box, then this starts the Close Project command, NOT the close dialog box. However, if you do not want to close the project, you can click on the cancel button when you are asked if you want to save the project. The models tab page has been removed in SysCAD 137. For the models list, please use the Explore Window. Most of the files in this window are for user information only. Referenced text files such as Reaction and Control files are set up for direct editing. The file structure also lists all units that are calling the reference text file. If any reports are present, the excel file can be opened from this window as well. : Double click on Nickel Project Report.xlsm will open the file in excel for editing. : Double click on Oxidising.rct will open the file for editing. Double click on Autoclave2 will open the Access Window for the unit that uses the Oxidising.rct. : Double click on Nickel.pgm will open the file for editing. Double click on CementationCCD_Control will open the Access Window for the unit that uses the Nickel.pgm. Note: The file list is not automatically updated, use the Refresh button to rebuild the list. 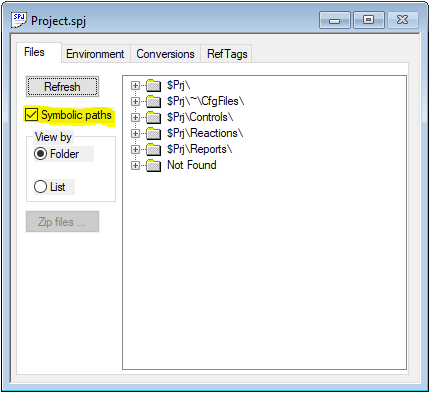 The environment page of the Project Window shows a list of names used for folder/file paths. Basecfgfiles: Basefiles folder. Must have write access. CfgFiles : The location of configuration file used by the project. (Path of the folder). PrjFiles : The name of the project. (Path of the project folder). ProgFiles : The location of the SysCAD executable and program files. TextEditor : Path of the text editor, used to write PGM files and so on. ReactionEditor : Path of the reaction editor, used to write RCT files. 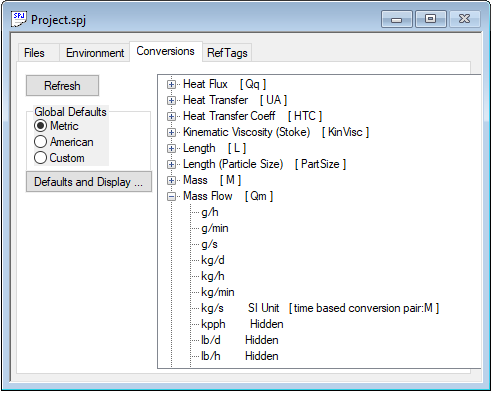 The conversion units' list displays all the Conversion types and units that are available in SysCAD. This list also displays the SI units used in SysCAD. The conversion table is stored as ..\SysCAD93\Basefiles\Default.93.db3 - table cnvs . To add/modify the existing engineering units (excluding SI units), refer to Conversions_Table for instructions. 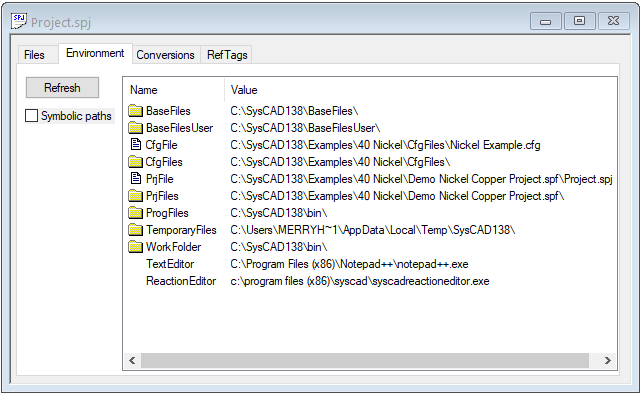 The Conversions window shown here is using SysCAD 9.3. This window will be slightly different in earlier builds of SysCAD. The Conversion units displayed in the project will be taken from the 'Metric' group. Conversion units that are displayed with the word 'Hidden' to the right will not be visible in the 'Change Conversion' display. The SysCAD SI unit for Mass Flow is kg/s. The default Metric Conversion unit for mass flow in this project is t/h. Please see Conversions for more information on this topic. 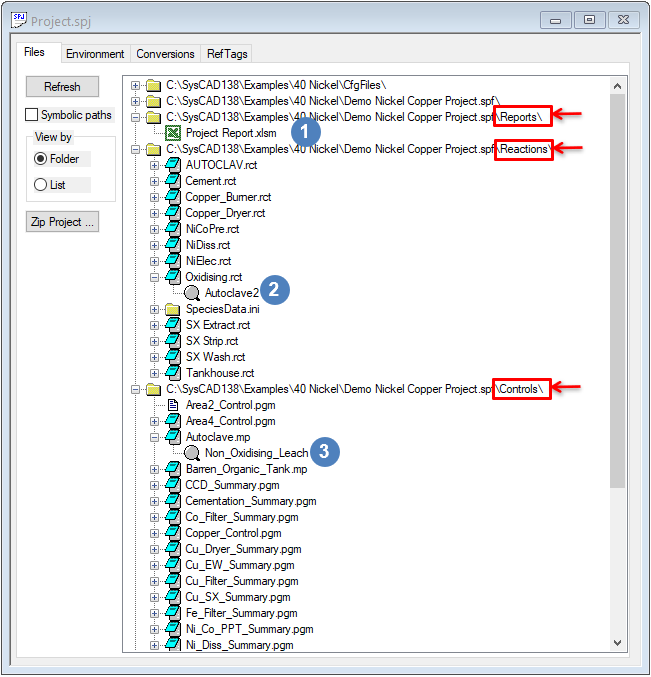 The RefTag list is for user information only, it builds and displays a list of all the reference tags used in the projects. These include any read/write (GET/SET) tags used by models (eg, PID controller, PGM files - General controller). The list is built during the first iteration of a project solve or project run. Therefore, if the project has not yet been solved, the list will not appear. To display the list, after the project solve/run has been started, press on the refresh button on the following dialog box. In this example, we can read that P704.Ti is an input variable for the Autoclave2_Steam controller (measured value). The controller output then manipulates the Steam_1.QmReqd (the steam 1 mass flowrate required) variable. The referenced tags are also indicated by displayed coloured triangles on the relevant access window or Trend window, as described in Controlled and Referenced Variables. This page was last edited on 2 October 2018, at 20:25.